His music runs the gambit of genres. While it’s technically classified as JPop, it also has electrometal, techno, rock, and even the classic rock ballad. Even though I don’t always understand what he says, he sings to a point that I can feel it, and that speaks more volumes than the language barrier. The ЯR Project began in 2001 with release of the album Rebirth and the Requiem et Reminiscence tour. It continued in 2008 with the release of his 28th single Jesus, 29th single Ghost, 2008-2009 Visualive Tour Requiem et Reminiscence II (the backstory of which is explained in detail on GACKT's official website) and now with RE:BORN. As with the rest of his albums, RE:BORN is in essence a collection of A and B-sides from GACKT's most recent singles, barring the 2 Kamen Rider Decade singles (Journey through the Decade and The Next Decade). However, unlike his previous albums, RE:BORN contains 2 discs - the actual album, and a drama CD, entitled "REBIRTH TO RE:BORN - ZERO'S MAIL." RE:BORN is a good album overall, but there a couple tracks I don't care for (Koakuma Heaven isn't a bad song, something about it just hits me wrong, and FARAWAY -Hoshi ni Negai wo- is just too upbeat for me). Some artists have the uncanny ability to make you really feel what they're trying to express. Even with the language barrier, I believe I understand the bitter story that GACKT is trying to depict in this album. Sometimes, even, the songs make me want to sing along. To me, the flow of RE:BORN splits the album into 2 parts. The first part focuses on the continuation of World War II after the events of Requiem et Reminiscence and the creation of the Nazi cyborg, ZERO, while the second focuses on the person that ZERO was. You'll better understand why I get that feeling, after you listen to REBIRTH TO RE:BORN - ZERO'S MAIL. JESUS -ЯRII- is a good starting point for the album because it conveys a sense of realization and remorse, meaning some time has passed in the ЯR story, since Rebirth. The lyrics are almost telling you that the war isn't going well, and in the PV for the single, you can see that the war's going so bad that the German wants to kill himself. The song itself is the same as the single version up until the ending, which is extended and has a live "finale" feel to it. SUDDENLY feels as if the war is just about to be over, and yet, while you are hopeful for tomorrow, you can't help but to look back on everything that's happened. The instrumental reminds me of a late-80s/early-90s ballad. NO REASON was always one of my favorites from GACKT's recent singles. Incorporated into the album, I get a sense of asking yourself, on the battlefield, just why you are fighting a losing battle. Is it to protect? For pride? Or...? IN FLAMES is almost melancholic in its sorrowfulness during the slow parts. But, GACKT's voice is so powerful during the other parts, that it's like a raging fire. At the end of the track, there's a slowing heartbeat, which to me, signifies ZERO about to be created. SAYONARA -ЯRII-, I feel is the soldier's last act. The track begins with nothing but a door opening, approaching footsteps and someone sitting at a piano bench. Then the piece is played with an accompanying violin (Oh YOU... How I love your violin-playing). Then after the piece ends, the soldier stands up and walks away with church bells ringing in the night sky, as if it's the soldier's time. GHOST marks the beginning of ZERO, as it starts out with what sounds like a machine powering up. In my opinion, the PV has a double meaning: 1) GACKT and the dancers were Terminators (the song was used as the opening for the Japanese version of Terminator: The Sarah Connor Chronicles. ), and 2) They were the GHOST unit (see Asakura's Report), which means that the person GACKT portrays in the PV is ZERO (which IS suggested in the booklet anyway). The ending of BLUE LAGOON -Shinkai- scared the hell out of me. I was playing the album via my PS3 w/ my 5.1 speakers. Unlike the B-side version, this one ends with a losing-power type of sound effect. This is where I believe ZERO's part comes to an end, which is suggested by the loss-of-power sound effect. I believe at the onset of OBLIVIOUS -Kao no Tenshi-, the now-deceased soldier's personality and memories somehow surface within ZERO, meaning the soldier is "in control." The song definitely has a nostalgic feel to it. I get the image of walking down a time-worn street, looking into the old and weathered buildings, and remembering long-forgotten memories. The next few songs are upbeat, which contrast with the first 6, and leave OBLIVIOUS -Kao no Tenshi- to act like an interlude. Although it's truthfully a tribute to deceased actor Ogata Ken, MY FATHER'S DAY could be about 2 characters in the story: the soldier's father for creating him, and the Nazi scientist for making him a cyborg -- stronger, more lethal, "immortal." Both opinions could be supported by this lyric: "The many things you have left for me." I might not like the song itself, but FARAWAY -Hoshi ni Negai wo- definitely fits on the album. The upbeat instrumental contradicts the sadness I sense from the lyrics. The soldier still loves a certain woman, but he knows that now that he's no longer human, it can never happen. So the soldier stays away from her and just watches. "I just want to say from faraway 'I love you'." FLOWER -ЯRII- begins drawing this entry to a close. Unfortunately, it's on a rather sad note. Even without referencing the PV, you can tell something happened to a loved one, just by listening to the emotions in GACKT's voice in the song. I highly recommend reading "Asakura's Report" (translated: Chapter 1, Chapter 2, Chapter 3) before listening to REBIRTH TO RE:BORN - ZERO'S MAIL. Reading the Reports beforehand will give you a much greater understanding of what's happening, even if you don't understand what the characters are saying. Even after my initial listening (before finding the Reports), I was in tears because I felt the emotion in the characters' dialogue. After reading the Reports however, I was floored because the story was so sad. ZERO'S MAIL basically tells the story of the album in more detail than my above reviews. ZERO'S MAIL alternates between "current" events and flashbacks to depict the tale. In fact, most of the drama CD is flashbacks. It begins in the "present," with the female lead, Maria getting a letter from the supposedly-long-deceased soldier who is now ZERO (thus the title "ZERO'S MAIL"), talking about the friendship between him, her, and Asakura Ryuuichi. A good number of the scenes focus on that friendship, with the war's events popping up throughout. It's pretty easy to figure out when's when, because the tone switches between bright and youthful and dark and war-torn. 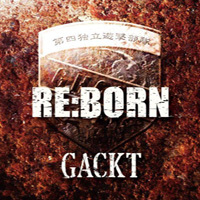 Truthfully, I wasn't all that fond of GACKT's recent singles themselves, so I wasn't sure what to expect from RE:BORN, especially seeing it had been 4 years since his last original album. However, I'm glad to say that it combines the singles into one cohesive album. Others will disagree, but I have to say that this is one of his best releases in years, and I love that it continues the story from a previous album. RE:BORN is definitely a "buy" in my books.